Installing programs in Mac OS X is unbelievably easy, with a simple drag and drop to the Applications folder being all it takes. Uninstalling is a different story, which is where AppZapper comes in. While dragging an application to the Trash technically qualifies as uninstalling it from your Mac, it doesn’t quite finish the job. A number of other files such as preferences, caches, installer packages, and startup items are still left on your hard drive unless you intentionally seek them out and remove them manually. An excellent way to avoid this clutter and all the frustration that goes along with it is to check out AppZapper ($12.95; free upgrades for life) — a utility that gathers the various files an application creates and erases them all at once. The great thing about AppZapper is that it’s not any more difficult to uninstall a program with it than it is to use the Trash. But it is a whole lot more powerful. All you need to do is drag and drop the unwanted application into the AppZapper window and it will automatically round up the associated files. A list of everything it found will be presented, allowing you the opportunity to review the results before you “zap” them to the Trash for good. AppZapper also features a useful drop-down menu for easily removing preference panes, widgets, plugins, and other 3rd party add-ons you might have installed. 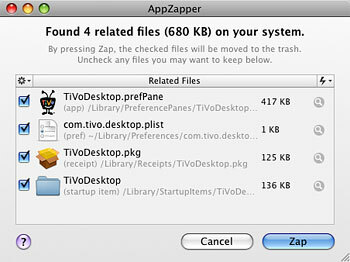 As you can see from my screenshot below, AppZapper found 4 unneeded items that were located in various places on my Mac’s hard drive when I decided to get rid of my TiVo Desktop preference pane. If you’re someone who likes to try out a lot of software, constantly installing and uninstalling apps will leave your Mac looking like a junkyard full of scraps. AppZapper can come in very handy to keep your Mac clean and tidy. Ready for the good news? The nice folks who developed AppZapper have agreed to let us give away a free software license (regularly $12.95) to a lucky MacYourself visitor! To enter, please leave a comment below, along with a valid email address (this is how we will contact you). In order to avoid spam filter issues, please type a coherent sentence saying you’d like a chance to win. Multiple entries will be deleted, so please only add one comment per person. And finally, don’t worry if your comment doesn’t appear on the site immediately — it might be awaiting moderation and will show up shortly. A winner will be chosen at random based on the comment number they happen to be. All entries must be made by February 2, 2009 at 11:59pm eastern U.S. time. In the meantime, download a free trial of AppZapper to try it out for yourself. Good luck! Congratulations to our winner Mike! His comment number was chosen from a random number generator and he has been given a free copy of AppZapper! Thanks to everyone who entered and remember to consider purchasing a copy of AppZapper to keep your Macs clean & tidy. 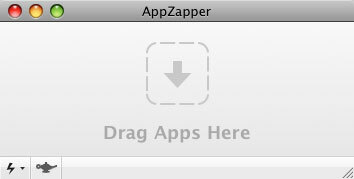 I think Appzapper is one of the main things that should be standard on a mac in the future. I’d like to be entered to win a free copy of of AppZapper. Thanks! I agree with Tom, it is so good it should be standard. I hope I win this, I really liked the trial. Ok, I wish me luck. I want this. I have heard good things about 1password and appzapper. I’ve heard AppZapper is the go to uninstaller for the mac, would love to get my hands on it! I like the drop down menu for easily removing programs and all the associated files that may be hidden. Sounds so simple to use. Please give me the chance to win this product. This sounds awesome! I want AppZapper! Gotta take the chance for an AppZapper dance. Fingers crossed. omg this is the best thing ever! !